For intraday traders… the following outlines my expectations for trading the last session before a long weekend. I always expect a narrow-range, low volatility and low liquidity market. I monitor it with an expectation of having no trades, UNLESS the market can prove that it wants to make a strong directional move. Only then will I trade. And as soon as I suspect that directional move is over I will stop. 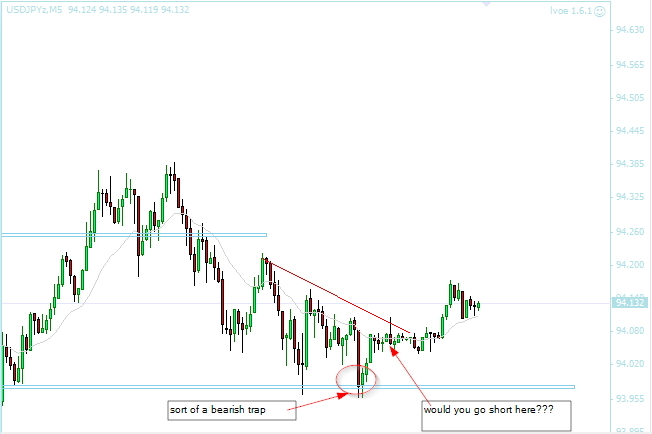 Would you go short here…or is there any obvious reason why this is a no-go?? It occurred after lunch (US time) on the last trading day before a long weekend. It's reasonable to expect that trading volume will be getting lighter. The environment is also getting tighter and tighter into an environment of narrow range congestion, as we would expect in such a context. The only way you should be trading on the last day before a holiday is if something causes significant directional movement. That is not happening in the USDJPY. When you say "The only way you should be trading on the last day before a holiday is if something causes significant directional movement. "…the trade you are referring to is taking a pullback (PB/CPB) after that move, right?? Ideally yes. My expectations on a pre-holiday session are ALWAYS for a rangebound market and I'm more than happy to have no trades at all for the session, unless the market can prove that it wants to trend. 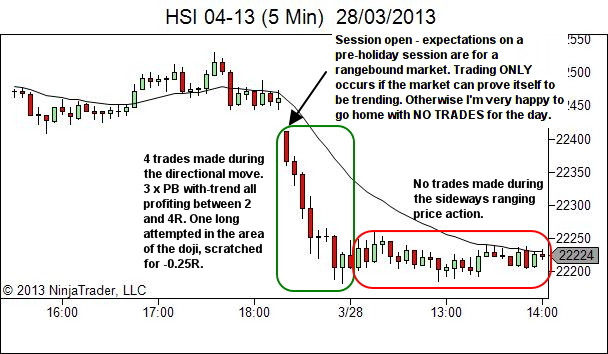 Thursday's session, which showed a couple of the trades in the last newsletter article, is one example. It was the last trading session prior to the Easter long-weekend. I anticipated a nothing day… but the opening drive led to a trending market for 45 minutes. I took only four trades in that period, three of which were a pullback setup as you've suggested. Once the trend ended… no more trades! Pre-holiday sessions are traded very conservatively. The market will prove a strong directional bias, or I'm not interested. See the image below which shows the higher timeframe (5-min chart). The post-holiday action can also offer opportunity. And it should be of great interest to higher timeframe traders (daily and 4H, 1H) as well as those operating on my lower timeframes. Pre-holiday action which congests into narrow ranges can set up some nice post-holiday moves (contraction leads to expansion)! Include in your trading plan or procedures manual how you plan to deal with any session that is different to "normal". This will vary from trader to trader (and market to market) but will include not just the holiday sessions but also maybe rollover sessions and key news releases. How will you manage the price action before the event. And how will you manage the price action after the event. Will you just stand aside? Will you monitor and only trade if there is a clear and strong directional bias? There is no right or wrong answer… just what works for you. Review the last half dozen or so of these "not-normal" sessions and make a decision about how you'll approach them in future.